Rich, sweet, soulful, and heartfelt with a touch of Texas Sass, Debra sings her favorite songs from Jazz and Swing Standards to Rockin' Texas blues accompanied by some of La's hottest musicians. Born in Houston, Texas, Debra now bides her time between Austin, Port Aransas, and Los Angeles. She started singing with a folk group at church in Austin while in college. Later she joined Austin's premier comedy sketch group, Esther's Follies, where she also sang and danced. She then formed her own sketch group, Better Than TV Players, where she wrote and performed parodies of jazz, swing, and Broadway tunes. During this time she worked with an all-girl group performing Andrew Sisters-type songs. Throughout the years, Debra has sung with many of Austin's folk, pop, and rock groups and several blues and Jump blues and Swing Bands in Los Angeles. She was strongly influenced by many of Austins' blues performers, including Lou Ann Barton, Stevie Ray Vaughn, the Fabulous Thunderbirds, Marcia Ball, Toni Price, and Forth Worth's Delbert McClinton. In Los Angeles, Debra met the late great J.J. Bad Boy Jones, a respected blues guitarist and singer in the B.B. King vein. She was his special guest vocalist on and off for about 10 years. Later, with blues/jazz guitarist Michael Carter, she formed her own band, the Backyard Angels, where they played a mixed blend of Southern blues, country, and rock. Debra has also performed in Los Angeles with Swing Syndicate, William "Soul" Porter, Flat Top Tom and His Jump Cats, Erik Estrand, Mark and the Torchlighters, and many other swing and blues bands. Debra is thrilled to have joining her: Karen Hammack on piano, George Friend on guitar, David Jackson on bass, Dave Victorino on saxophone, and Steve Mugalian on drums. Together with this extraordinary group of talented musicians, a dream was realized in her first CD, Come Dance With Me. For your listening and dancing pleasure, Debra sings her favorite selections of swing and jazz standards and southern blues. Her latest CD "Boogie My Blues Away with the Austin Texas Smokin' Aces and her 2nd CD That's Right!" is also available on CDbaby. More Rockin' Blues and Rockabilly! I LOVE this CD! It is great to dance to or just sit and listen (although you can't help but tap your toes!) Debra's voice is beautiful and her musicians are awesome. I can listen to this CD over and over again - a must for all dancers. Debra's voice is beyond lovely filled with heart and soul. I LOVE LOVE LOVE her voice. Great songs. Swing dancers must have this CD! It stays in my CD changer for driving time !!! Great Styling with sweet vocals. The CD has all of my favorites - Swing - Texas Blues - Romance - & standards. It all comes together with the artist's great Talent !!! I listen to it often when I want to be musically up lifted & snapping my fingers. This is a great mix of jazz, Texas blues, and swing. Debra has a beautiful, rich voice. After listening to her CD, I'm looking forward to checking out a live performance. It is an enjoyable mix of music styles and it sets a very nice mood. I enjoy the blues/ jazz influences. I would recommend this CD. This CD ireally gets your toes tapping! A really fun, yet soulful, CD. Debra Watson really gives it her heart and soul, adding a personal touch that breaths some fresh air into these classics. You forget how wonderful they are, until a great singer and band bring them back to life, and suddenly you're tapping your toes and wanting to get up and dance. My favorite is "You Can Have My Husband." What a riot! I love this CD. It satisfies no matter what mood I'm in. This collection of songs is so enjoyable! The CD has something for everyone. It's mellow, soothing, spunky, and fun. It's great for easy listening or for dancing energetically. I especially enjoy it while I'm cooking in my kitchen. A friend plays it in her hair salon for her customers. I can't wait to share it with everyone, especially my musician friends. Wonderful to listen to or dance to. 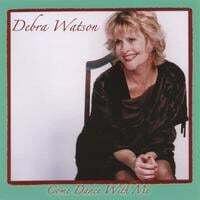 The Debra Watson CD "Come Dance With Me" is a wonderful collection of classics. It is nice to listen to or dance to. Debra does Etta James and Jo Stafford proud with her renditions of their songs, "At Last", and "You Belong To Me". Glenn Miller and Ray Eberle, move over.